Life of a Catholic Librarian: Tea Time with Tiffany Episode 7 - Writing, and current blog projects update! 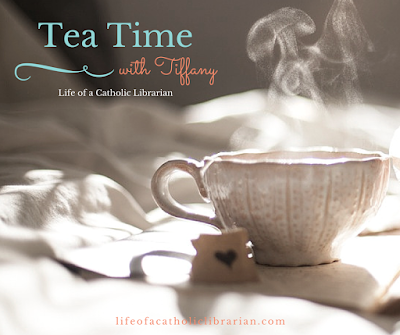 Tea Time with Tiffany Episode 7 - Writing, and current blog projects update! This week I'm talking about summer projects for the blog, as well as writing in general. I've always loved to write, and want to know how I got started? View on, dear viewer! Chaplets audio project update - links as soon as they are available! My spring 2015 blog identity crisis, and happy resolution. My childhood love of writing, details in the video! First piece at CatholicMom.com will go live Monday July 13th, I will post a link! For all of the increased interaction in the comments on this blog, THANK YOU!! St. Francis de Sales - patron saint of writers. Finally, what do YOU want me to write about more, both on the blog, or potentially in a future formalized place, like a book? What are your favorite topics that I discuss? I want you, my community, to help me frame this project that has been a dream of mine since childhood. Please write in and let me know your thoughts! As someone who is always short of time, I like to read about how people integrate their religious practice into their lives. I am particularly waiting for your chaplet recordings:) I also adore reading about your dance adventures. Amy, fascinating! Thank you so much. I too am very curious to see how these chaplet recordings will go :) and what other projects I can come up with that incorporates in the audio recorder. And I'm so glad to know that you like the dance posts! Shelia mentioned that earlier this year as well, that the dance posts were her favorite. I'm so glad to know that because I sometimes shy away from sharing dance stories since I didn't know who among my readers would also enjoy reading about that niche. Thanks again!